Deep Sleep Comforting Milk Bath Float // Coconut Body Butter // Spa Wisdom Africa Honey & Beeswax Hand And Foot Balm // Almond Conditioning Hand Wash // Honey Bronzing Powder // Almond Hand & Nail Cream. I know I've just posted about putting myself on a spending ban but this order was made last week before I started it. I'm going to blame Leanne for this as she posted about a 50% off code for The Body Shop. The whole reason for this order was to finally get my hands on the Honey Bronzing Powder which was sold out last time I made an order. With the discount, the bronzer came to £6.50 which is such a bargain although I did add a couple of other products to my basket so money wise it wasn't really such a bargain. Another product that was sold out last time was the Coconut Body Butter which is perfect for winter skin or to keep feet hydrated. The other four products I haven't heard anything about but thought they sounded interesting. I just placed a huge order through The Body shop too, I just can't get enough of their products! I just bought some of their candles and reed diffusers and they are amazing! 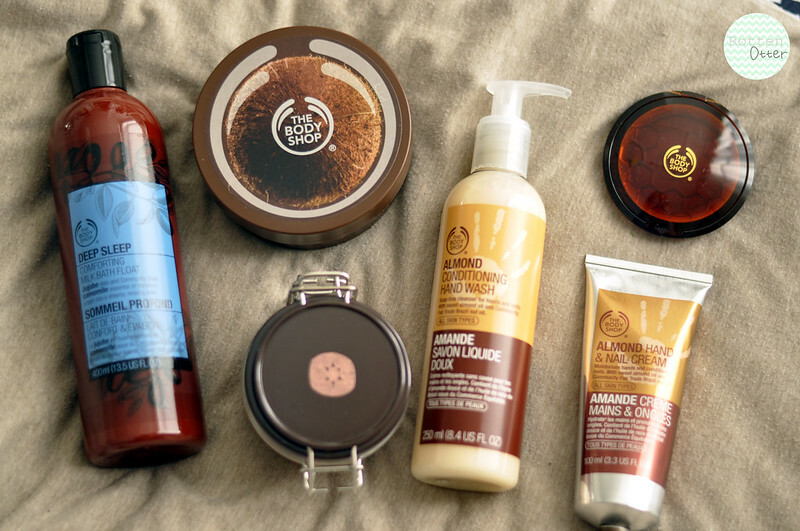 The Almond range from The Body Shop is my favourite. It smells lovely and its very hydrating. Who could resist a 50% off code? !